Calculating consumer surplus with all you can eat - FreeEconHelp.com, Learning Economics... Solved! This post goes over the example problem of calculating consumer surplus from different scenarios. The scenario sets up by giving you a table depicting a demand curve and then asks you to calculate consumer surplus with different prices. Finally, an all you can eat scenario is introduced where you pay a flat fee to enter the transaction but the marginal cost of each additional unit is effectively zero. 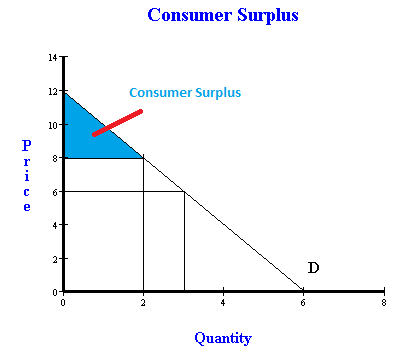 Check this past post for a review of calculating consumer surplus. a. If the price of an additional serving of hotwings is $6, how many servings will be purchased? How much consumer surplus does will you receive? The information from the table tells us that we have a downward sloping demand curve that intersects the price axis at a price of $12, and the quantity axis at a quantity of 6. If we assume a price of $6 as in (a) then we will get a quantity of 3. 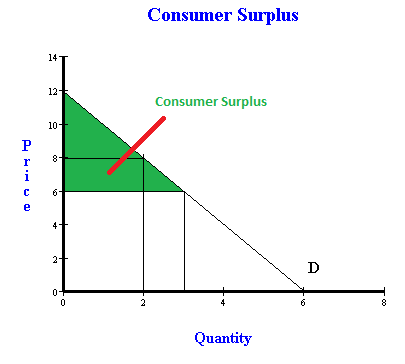 Consumer surplus can be calculated by looking that the triangle that is below the demand curve but above the price. For (a) the triangle will have a height of 6, and a base of 3. Multiplying base times height and dividing by two gives us $9. You will receive consumer surplus equal to $9 with this demand curve and a price of $6. b. Imagine the price of a serving of hotwings is $8. 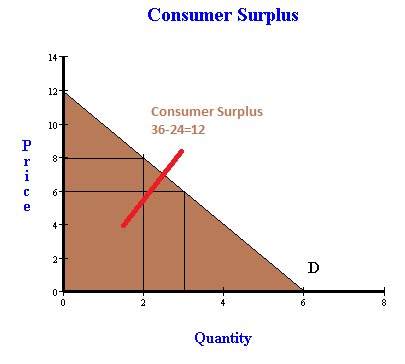 By how much does your consumer surplus decrease compared to the previous week? If the price goes up to $8 per serving, then we use the same process but have a smaller triangle. In this scenario, the height of the consumer surplus triangle will be $4, and the base 2. This gives us an area of $4, so your consumer surplus would be equal to $4. c. One week later, you return to the restaurant again. You discover that the restaurant is offering an “all-you-can-eat” special for $24. How many hotwings will you eat now and how much consumer surplus do you receive now? Consumer Surplus with all you can eat. d. Suppose you own the restaurant and your demand curve represents a “typical” customer. What is the highest price you can charge for the “all-you-can-eat” special and still attract customers? Finally, we can answer (d) using information from (c). If your consumer surplus is $36, the maximum you would be able to charge and still have them take the deal is $36. However, at this price people would be indifferent between doing the deal or not, so it would make more sense to charge $35.99 in order to ensure they take the deal (and have positive consumer surplus).